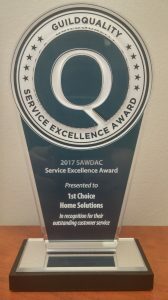 The 2017 SAWDAC Service Excellence Award has been awarded to 1st Choice Home Solutions by GuldQuality and SAWDAC (Siding and Window Dealers Association Of Canada). This award recognizes contractors who are leaders in customer service across Canada. All applicants submitted their past customers information for GuildQuality to survey about their experience with the SAWDAC contractor. Questions included how the contractor communicated, the quality of materials, job site cleanliness and overall satisfaction with the process and if they were likely to recommend. 1st Choice Home Solutions achieved a 97% recommendation rate which is over the average 88%. 1st Choice Home Solutions is very honoured and appreciative to be apart of this award and are hoping to continue our success in the years to come.